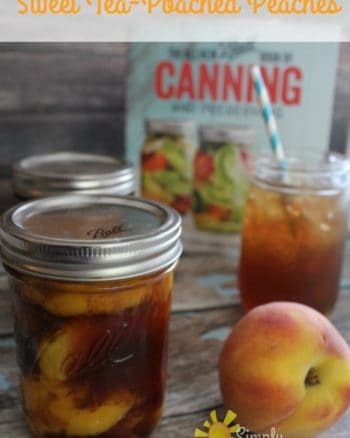 While you are canning all your yummy fresh veggies like carrots, beans, and potatoes you definitely want to take a little time to can up things like this delicious canned apple pie filling. 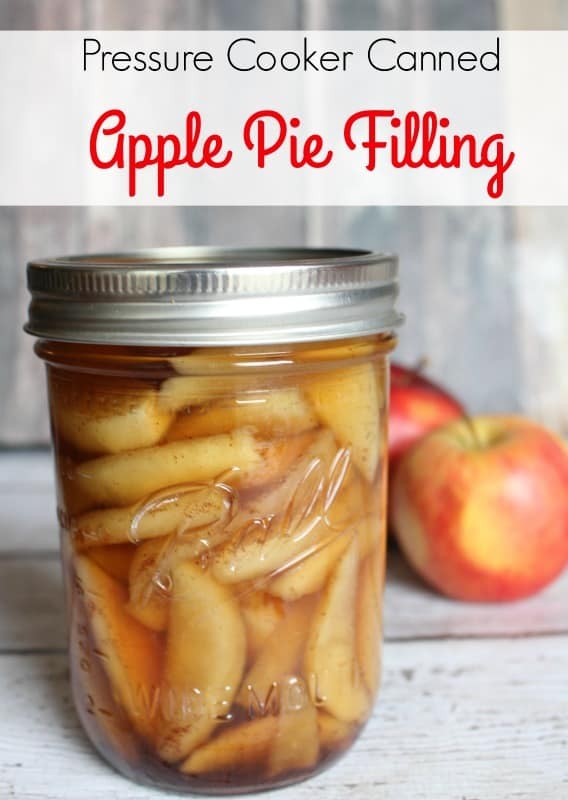 It can be used of course as filling for a homemade apple pie and also warmed up to top pancakes, waffles, ice cream, and more. I put my new pressure cooker to use on this one and had 4 pints of apple pie filling ready in no time to put up in my pantry. This makes a fantastic hostess gift for Thanksgiving or as a Chrismas gift tucked into a basket with a pretty pie pan and a dish towel. Peel apples and cut into slices or chunks, however you prefer. 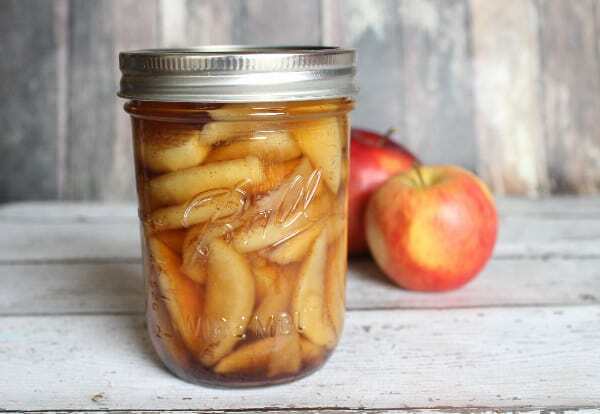 Fill jars with apple slices. 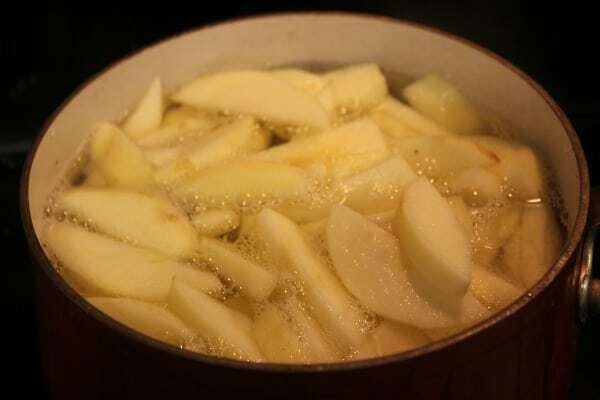 Place apples, lemon juice, and water in a large pot, bring to a low boil. Stir in cornstarch, brown sugar, nutmeg, cinnamon, and salt, simmer for 5 minutes. Since I use it for a variety of things I don't put quite as much cornstarch to thicken the syrup as traditional pie filling usually calls for, if you prefer a thick filling you can increase to half a cup. 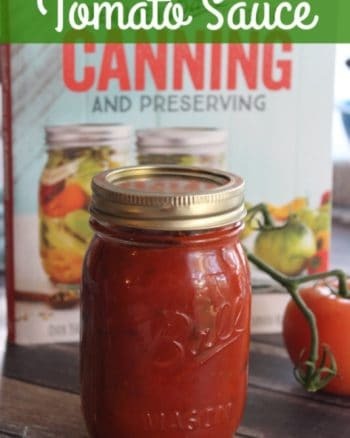 Pour mixture into clean sterilized canning jars, leaving 1″ of headspace. Wipe rim with a clean damp cloth, secure new lid and ring tightly. 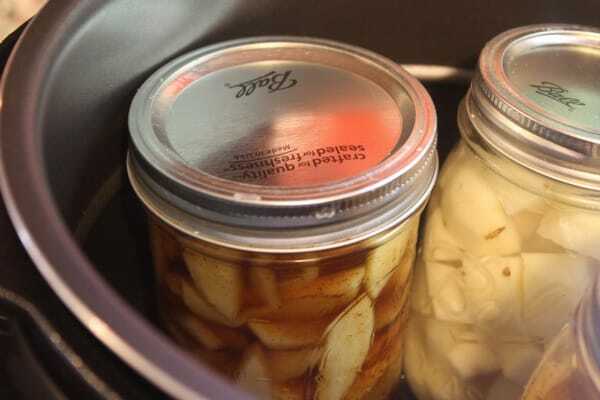 Place jars in a water bath for 20 minutes or in a pressure cooker for 10 minutes. Remove from heat and place on a dish towel (a cool counter might crack hot jars). 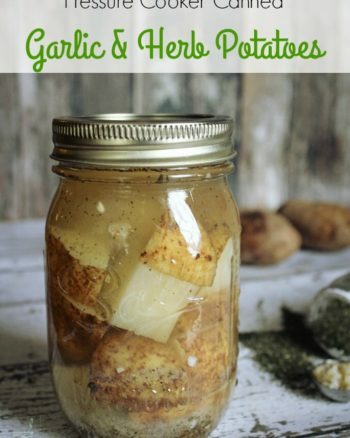 Once cool be sure that they have sealed then add to your canned goods in the pantry and enjoy as you wish! 1 quart of apples fills a 9″ pie pan. You can easily make this sugar free by switching the brown sugar out for brown sugar Splenda. 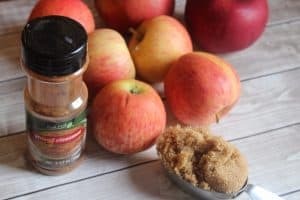 This looks delicious, I can’t wait for apple season to be in full swing so I can make some!! Do you think I could use coconut sugar instead of brown sugar??? Hi Camelia! Honestly I’m not sure on the coconut sugar but I will say I’m big on trying new ideas and new ways of doing things so I totally say try it. Do a small batch just in case it goes South on you. Please come back and let me know if you do try it. Thanks so much for stoppping by and commenting. This looks so much better than canned! Thanks for sharing at Merry Monday! 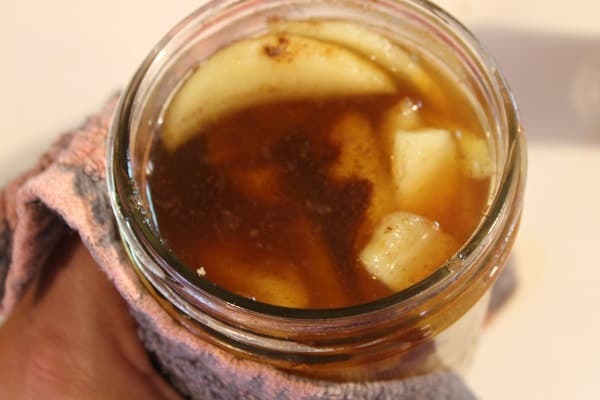 There is nothing better than making your own apple pie filling. You can control your ingredients. Best part is in the winter when you can use them. Love apple pie! This filling looks delish! It’s been a while since I made apple pie filling. I think I used the water bath canner on mine. It looks very pretty in your pictures. Thanks for sharing on Family Joy Blog Link-up. Please come back and join us again! Remember to leave your host a comment to increase the chance of being featured. Thank you Charlotte! Comment was left. Thank you for stopping by and taking the time to comment. Thanks Charlene! I love linking up!